Jeff Baena’s (I ♥ Huckabees) feature debut, Life Of Beth tackles the very odd sub-genre of zombie comedy, or zom-com as it is also known. Although the plot shows a lot of promise, as well as a cast of seasoned and up and coming actors, the film never quite gets off the ground, reminding us just how weird the mash up of two seemingly unrelated film genres is. Aubrey Plaza (Parks and Recreations) plays Beth Slocum, a teenage girl who dies from a snakebite, only to mysteriously return from the dead, days later, much to the surprise of her parents (John. C. Reilly and Molly Shannon) and her mourning boyfriend Zach Orfman (Dane DeHaan), which whom she was about to break up with before her untimely death. Taking solace by spending copious amounts of time with Beth’s parents after her death, Zach is clearly very torn up, to the point where he is doing everything in his power to keep his mind of his late girlfriend’s death. Things take a pleasant turn for Zach when he realises that Beth does not recall their breakup and assumes the two are still dating. Realising he gets to do things over, Zach makes the most of his second chance at love. Eventually things start to get strange as Beth’s behaviour becomes borderline obsessive and Beth herself starts to become aggressive. As revealed in the film’s trailer, Beth is revealed to have returned as a zombie. From this point on, the destination of the film seems uncertain. Baena focuses on the importance of the film’s central relationship, playing on love, loss and grief, whilst throwing in a few zombie –apocalypse gags, but in doing so neglects many of the other characters, such as Zach’s parents who have a barely-there role in the film, certainly more screen time could have been added for Zach’s brother Kyle (Matthew Gray Gubler), whose responsible for many of the comical lines in the film, as well as the ever quirky Anna Kendrick, who has a very minor role in the film. The film starts off as a dark comedy with a tinge of horror, but by the film’s end, turns into a horror movie that’s digging a bit too deep for laughs. Although DeHaan gets quite a lot of screen time, he doesn’t have much of a character to play, as opposed to his roles in The Amazing Spiderman 2 and Kill Your Darlings. Baena, however, made a great decision in casting Plaza as Beth, her navigation from sweet girl in a sundress, to the lovable misanthrope she usually plays, is very well done. Plaza is both adorable and terrifying at the same time. 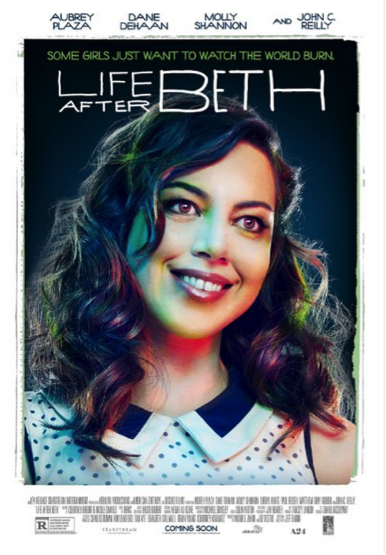 With more direction, Life After Beth definitely could’ve been improved, although Baena does deserve some admiration for tackling such a complicated genre. Life After Beth will surely draw some comparison to Edgar Wright’s ‘Shaun Of The Dead’, and in all fairness, it is one of the best additions to the category as of late, although there isn’t a lot of competition. Set to be released in 2003, in hindsight Baena should’ve released the film when it was originally written, where it’d be one of the first films of its kind, rather than now where it seems like an attempt to revive a struggling sub-genre of film. This entry was tagged anna kendrick, aubrey plaza, beth slocum, cinema, dane dehaan, film, film festival, film review, jeff baena, john c reilly, life after beth, matthew gray gubler, Melbourne, melbourne international film festival, miff, molly shannon, zach orfman, zom-com, zombie, zombie comedy. Bookmark the permalink.